I am writing this about and for Richard Demarco, to show him my appreciation and respect, a couple of days before a special event takes place for him, in a quiet way, in Edinburgh. I am incredibly proud to call myself a friend of Richard Demarco, a man who has had a profound effect on the lives of many and varied people in Britain, Europe, and around the world, through the world of Art, from his base in the ‘cultured’ city of Edinburgh. On Monday 24 March 2014 Richard Demarco CBE will receive the highest award that his own city of birth has to offer. It has been a long time in coming, and I am one of the many who warmly applaud Professor Demarco in receiving this, the Edinburgh Award. He certainly has gone above and beyond boundaries or expectations and, unasked, has done more than most to foster links and goodwill between the United Kingdom and the rest of the world, using Art in all its forms as his medium and communication tool. With family origins in Italy, and Scotland as his birth place, in his own right Richard Demarco is a most talented artist, his sketches and watercolours amongst some of the most beautiful, and informed, that I have ever seen, and for this alone he gets my recognition and respect. Richard Demarco is also one of the most passionate people I know, a true phenomenon, with the most incredible stamina and verve for life. Those who have been in his space have felt captivated by Richard and hearing him speak is an experience that few are left untouched by; he is, quite simply, a force to be reckoned with. For many reasons, Richard Demarco’s own life deserves documenting, his own personality and grace applauded, and his own words heard – but always he thinks of others. Richard quickly sees where there is magic in people he meets, always seeks ways to put people and their given talents together, constantly looks for ways to better others’ lives. He has his own voice, undoubtedly clear and strategic, but he is always mindful of his fellow man… and, need I say, he is always mindful of his environment too. Richard is, without doubt, a thoughtful man, on every level. Now in his 84th year, Richard Demarco has an archive that would take your breath away. The Demarco Foundation Archive contains immeasurably valuable historic records, incredible and inspiring artworks by others, many that will have to remain hidden, at least until a suitable place is found to safely house and make the entire collection available to the public, in perpetuity. Amongst the vast collection of international artworks, are records of deep and significant meaning, documented life witnessed and shared and expressed by others, which spans at least six decades, including information about and material from each and every Edinburgh Festival since its inception. Most profoundly, amongst the Demarco Archive are excruciatingly insightful, haunting and valuable records, giving glimpses into personal links with all sorts of artists and others in Europe and Britain during World War II. This part of the collection, alone, is worth national protection. Many do not know this, but Richard Demarco has participated, in one significant way or another, in every single Edinburgh Festival, since it began in 1947. He remains committed to its original purpose, wishing to see it become once again the cultural and elegant festival which it used to be, where people’s spirits were lifted, lives enriched and elevated through Art in its many forms. 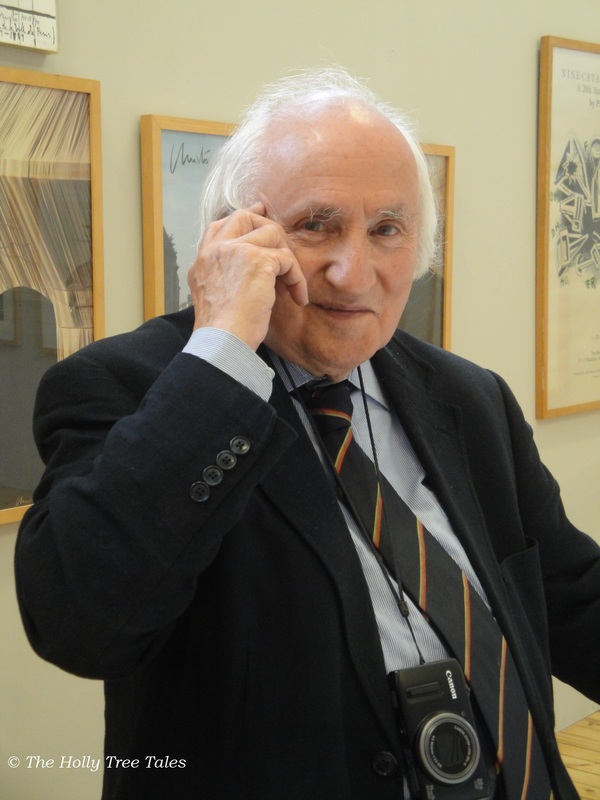 Recently recognition for his positive role in humanity came from distant shores, when Richard Demarco was named European Citizen of the Year 2013. This is something that Edinburgh should be immensely proud of, and proves not only his commitment and loyalty to people everywhere, but his longevity of ambassadorial goodwill. A passion that I share with Richard Demarco, besides a commitment to take care of our environment by planting trees (reference the oak trees planted by Joseph Beuys in Europe, as a symbolic gesture decades ago, with the expressed wish for this to continue, to protect the earth, the bees, and our lives), is to hear the voices and the hearts of children everywhere. Children, after all, will grow up to be the people who lead us, and it is for them that we ought to live well and decide our actions with wisdom now. Through Richard I learnt about “Room 13 International”, a movement that began in the West of Scotland about twenty years ago, which is now global, empowering the lives and minds of children around the world. I was especially touched to learn that “Room 13” exists in several areas of South Africa, the country where I was born and grew up, and that “Room 13” was one of the movements close to Nelson Mandela’s heart. He, too, cared deeply for children. Like Nelson Mandela, young people delight Richard Demarco; he never seems to tire of engaging them in elevating thought and suggesting opportunity. Like the artist Joseph Beuys, Richard believes that everyone is an artist – and that this is something to be nurtured young. While he encourages Art, in its many and varied forms, most of all I get the impression that Richard Demarco responds to beauty, and to where he sees love present, wherever and however it is expressed – however deeply or otherwise – as long as it is truthfully expressed. In some ways, Richard reminds me of Gandhi, who once said words to the effect that “it is expensive to be my friend …”, because Richard Demarco’s visions are enormous, his effect in the world he influences great, while his own means remain surprisingly humble. I love this man Demarco. I love that he is who he is and has done what he has done. He has annoyed some, he has delighted others. That matters little to me, because in him I see the truth lived out, and he is, like all of us, a mere mortal. I love Professor Richard Demarco’s passionate commitment to the human race and to elevating the minds of everyone he comes in contact with, whatever the means, regardless of age, background or creed. Richard Demarco is fearless in the pursuit of his passion: to stimulate consideration and thought, and to empower others. This I love and resonate with most of all. As you prepare to receive your Edinburgh Award, so justly and rightly deserved, I want to say that I believe you are a shining star, Richard, and I am deeply humbled and grateful to know you as a friend, and a mentor in the journey of life. Bravo and congratulations on receiving The Edinburgh Award … not yet, perhaps, the greatest of your many ongoing achievements, but certainly a highly significant one, and the one that has been the most immediately deserved, yet has taken the longest to arrive. Well done, our friend, well done.